Posted 5/10/2018 10:03am by Cherry Valley Organics. Our delicious mushrooms are a favorite of many of our Farm Share subscribers and farmers market customers. 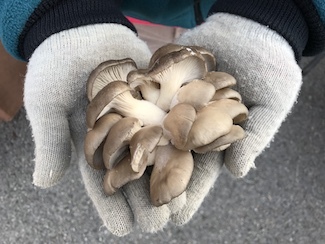 Baskets of meaty shiitake and flavorful oyster mushrooms are one of our most prized crops here at Cherry Valley Organics. We're frequently asked how we grow these delicious fungi, so we thought we'd share a step-by-step of how we grow shiitake and oyster mushrooms here at the farm. Step 1: Log selection. We begin the mushroom-growing process by hand cutting the correct types of wood from an overgrown field here at the farm. Tim searches through the lot, looking for prime logs of the correct diameter and species. 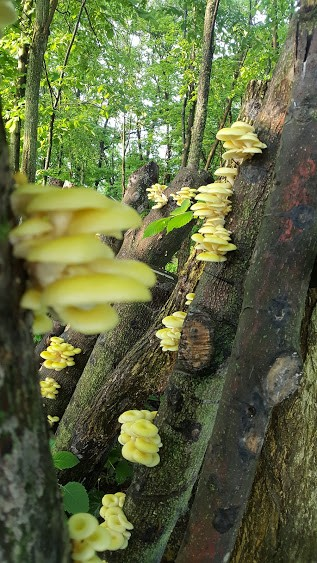 Since different trees support different mushrooms, this is a very important step in growing our shiitake and oyster mushrooms. 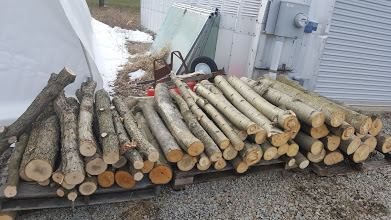 The trees must be live when the logs are cut, so finding logs that are perfect is sometimes challenging, but it's an effort that's well worth it. For growing shiitakes, we use oak, and for growing oyster mushrooms, we use aspen and willow. The logs are always cut during the dormant season. 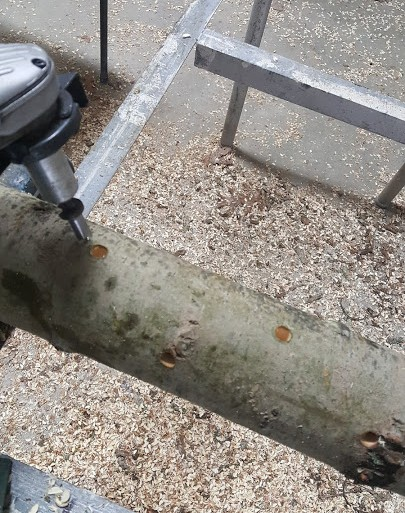 Step 2: Drill the mushroom logs. 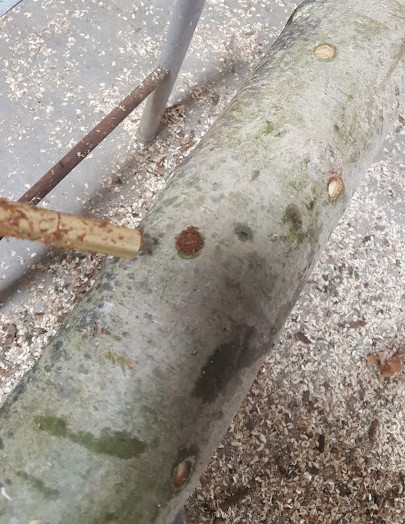 After the logs are cut to a length of approximately 4 feet and aged for up to 2 weeks, one-inch-deep holes are drilled into the log on all sides, about 4 to 6 inches apart. The holes are staggered to give each group of mushrooms plenty of room to grow. This is a time-consuming process as the holes must be carefully drilled to maintain the proper depth. We use a specialized drill for this process to ensure it goes smoothly. Step 3: Insert the spawn. Immediately after the holes are drilled, we fill them with spawn. The spawn we use to grow both shiitake and oyster mushrooms consists of sawdust colonized by the spores of each type of mushroom. The spawn mixture we use is certified organic and it comes from Field and Forest Products, a specialty mushroom spawn and supply company. The spawn is packed tightly and carefully into each hole to ensure good contact with the wood inside the log. Step 4: Seal the holes. 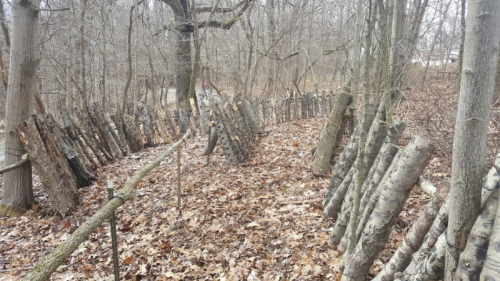 To prevent the spawn and log from drying out, we then seal each one of the spawn-filled holes and the cut ends of each log with wax. Tim uses a paintbrush to apply melted cheese wax. 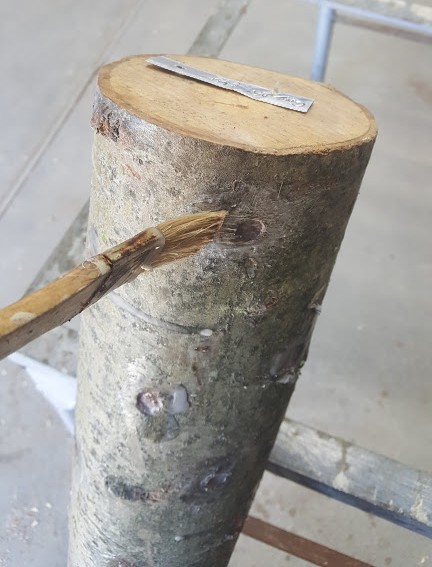 Sealing all the cut surfaces properly keeps the log healthy and actively producing for up to 6 years! Step 5: Label each log. 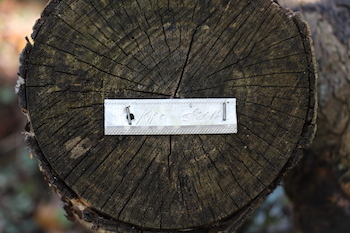 The final step in the process is to then attach a permanent metal label to the end of each log. The label notes which mushroom variety the log was inoculated with and the date of inoculation. We then prop our mushroom logs on end and line them up side-by-side in the shady woods. It's essential that the logs stay out of the sun or they'll dry out too quickly and won't produce a good mushroom crop. It takes between 3 months and a year for mushrooms to begin to grow from the spawn holes, but once they do, they'll produce multiple flushes of mushrooms per year, often in the spring and then again in the autumn. 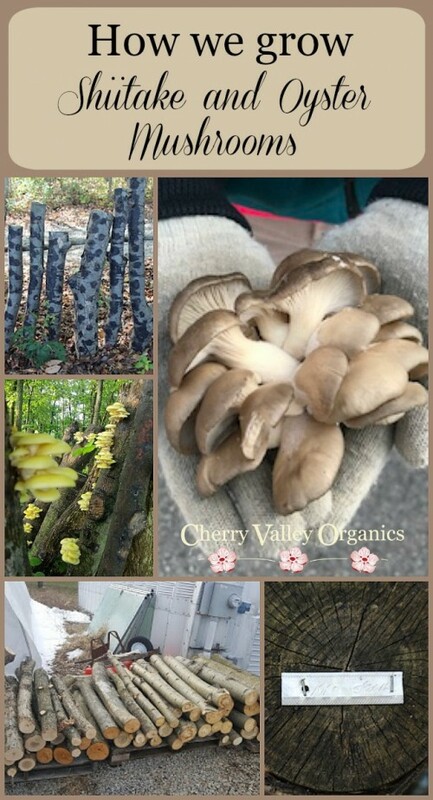 One of the perks of growing shiitake and oyster mushrooms on a small scale, like we do at Cherry Valley Organics, is that we can constantly monitor and harvest the logs on a regular basis to ensure each mushroom is picked at its peak. To purchase our organic shiitake and oyster mushrooms, sign up for our Farm Share program for a weekly delivery of our fruits, veggies, mushrooms, and more. When growing conditions are right, we often have them at the Sewickley Farmer's Market, too. We've also heard from many customers who would like to try their hand at growing mushrooms themselves. For those customers, in the spring we sell pre-inoculated logs that are already prepared and ready to grow. Simply take a mushroom log home, prop it up in a shady area, and wait for the mushrooms to sprout. It's a great way to share the joys of growing mushrooms with friends and family without having to drill and inoculate the logs yourself. We have pre-inoculated logs for sale at various events in the spring, including the Sewickley Farmer's Market on Saturday mornings.